Just a quick post with some useful links to resources and feeds to keep up to date with events at Gunung Agung. I will continue to update this as I find/get sent more resources. If you find anything on your travels around t’ interweb can you post it in the comments, please? For the majority of these links, you’ll need to run the text or the complete page through Google Translate, or other equally amusing translation software. Source: K. Fontijn et al. I’ve added four extra lines made from linear regressions over the areas that they cover. #1 is a regression over the whole set, #2,3, and 4 are regressions over smaller sections. #2 is the rapid period mentioned in the text, #3 is the lower rate, also mentioned in the text, and #4 is the current rapid rate. So that it’s easier to work with, here are the characteristics of each regression. If the duration of the previous rapid rate is any indicator, the current rapid rate may be ready to switch to the slower speed, though it does seem a little early for that. The slope of #3 is steeper than #2… meaning the current “rapid rate” is higher that the previous one. Maybe the higher rate means it has “burned out” and will switch back to the slow rate early. Dunno, I’m not a geologist. The blast extended to 27km away from the volcano and the lahars almost 80km away. Volcanic bombs can fall up to 50km during such eruptions. Volcanic lightning can also occur quite away from a volcano and floods can travel more than 100km. I speak of a regular VEI5. A caldera blast is worse, it affects even further away. I would say good to stay at least 50km away from Agung. (And outside of Bali if it goes caldera) A safety zone of 15km is definitely not enough. David Johnson was just 10km away. What Irpsit said is correct, but just a caveat here. Mt. St. Helens was a lateral directional eruption, so all the eruptive products came out in the same direction that the landslide occurred. So instead of erupting “upward” like a traditional volcano, the explosion went sideways, which is why the eruptive products went so far. As a reference, Pinatubo’s VEI-6 eruption that was a straight upward blast sent pyroclastic flows as far as 16 kilometers from the main vent, so people outside the exclusion zone should be fine if the eruption does not go larger than VEI-5. With that said, ashfall and lahars will be the biggest hazard to normal people in Bali, and they will travel quite far. An eruption will likely be very damaging to people’s crops and property here, which would be unfortunate. Ash is more dangerous than many people may realize. IF you go outside, you’re exposed to the elements, and it has the problem of being extremely damaging to one’s lungs and difficult to walk through. If you stay inside a building, you run the risk of being in a building that may collapse from the weight of ash build-up. If a caldera blast were to occur, then things are far different. This is unlikely, but would be a very very major worldwide disaster story were it to occur. Please note the geological map that shows that almost the entire, heavily populated tourist area is built on the “Ubud Ignimbrite” flow of Ancestral Batur’s VEI 7 ~30kA BP. Not that there seems to be any great risk of such a large eruption at present, a VEI 3 – 5 is far more likely. That is still the best overview of Bali volcanics available. I think the volcanoes on Java’s east end are the same volcanic group, and their calderas should be included in the discussions. I agree. They seem to follow a pattern where an ancestral stratovolcanic edifice is destroyed by a VEI 7 ignimbrite generating super-colossal eruption that forms a ~10 km diameter caldera. Some 5-10 kA later, a second large, caldera-forming, ignimbrite producing eruption follows (VEI 6, colossal ) which forms a nested 5 – 7 km diameter caldera. Judging by the inferred sizes of the ancestral Catur and Batur edifices, Agung is not quite yet large enough but one never knows for certain. The Ijen caldera in Java is even bigger at ~20 km. There has been an eruption on Sinabung . They’re “only” 4 years late! Well yeah, but they act like it’s something new, but it’s just another (relatively) unremarkable explosion. Not particularly energetic… that’s a 2.19 m³/s DRE ejection rate. If it sustains that rate, in 2 hours and 46 minutes it might make it to VEI-1. I take it the increase in seismicity on the graph for Gunung Raung is because of Agung? Oh right, of course! On the map on Magma Indonesia. From the plot of the holocene eruption rate (see the post at the top), it seems that it would be rare to have more than two large eruptions in a row. According to an internet site, Surono (who as far as Carl and myself are aware has never been wrong and whose predictions have been pretty (read “eerily”) accurate most of the time) warns about a “huge” eruption. Government volcanologist Surono, who uses one name, said the feared eruption could be huge and potentially also close airports in East Java and Lombok, according to local media reports. Agung is in the north of the island about 43 miles from the tourist hotspot of Kuta. People have been told to stay at least 6 miles from the crater, but to stay 7.5 miles away when to the north, northeast, southeast, and south-southwest. “Huge” is not a term used to describe volcanic eruptions, but to judge by the size of the exclusion zone it would indicate that it might be a question of a cataclysmic eruption (VEI 4), which is bad enough given the topography of the surrounding landscape. From the difference in extent due to direction, with the steepest incline to the north, I would hazard a guess that large pyroclastic flows or base surges may be predicted along with significant stratospheric injections of ash (eg. airport closures). Below is a translation of a Tribun Bali interview with Surono. I had a lot of help from Bambang Ardayanto, who did most of the work. This interview is important as it shows the levels of uncertainty the scientists and government officials are dealing with. When the news regarding volcanoes at Indonesia are going widespread, Mr Surono become one of the people who people are looking for and asking him for his analysis and getting his opinion. That is understandable since Mr Surono (62) is an expert of volcanology and geophysics in Indonesia. Grandpa Rono, what he is called in Indonesia, was very popular during the Merapi, near Yogyakarta city, eruption in 2010. During that time, he was the Chief of PVMBG (Pusat Vulkanologi dan Mitigasi Bencana Geologi) or Center of Volcanology and Mitigation of Geology Disaster. Mr Rono, a graduate of University of Savoei, Chambery, France, was on Sunday (24/9/2017) in Bali, and accompanied the team from the Ministry of Maritime Coordination even visiting refugees at the camp at Tanah Ampo, Karangasem. If Mt Agung erupts, how powerful might the explosion be according to your opinion? If we refer to the 1963 eruption, it could be same. But it can also differ. Maybe lower, maybe greater or maybe no explosion? TB: Why might there be no explosion? S: Because we cannot rely on the tremor frequency only. If there is frequent tremor and all of the gas is released from the magma, it will not produce an explosion. We can’t predict based on tremor activity and then make an explosion or eruption power prediction. Tremors or volcanic earthquakes are a sign of the high level of volcanic activity. This level of activity can’t be used as a reference to predict a big eruption, even if the level of volcanic earthquakes and volcano activity inside the crater increases. TB: from the monitoring signals of the activity at Mt Agung that you have observed, can we conclude if and when Mt Agung will explode or erupt? S: No, we cannot. It should be understood that warning alert levels like Warning (Awas – the current level), Watch, Advisory, or Normal, are not to predict when the big eruption will come and how powerful the eruption will be. Although the volcano activity is increasing, people cannot judge if it will lead to an actual eruption. So, if the magma starts rising up, does it mean the eruption will occur? No. We don’t know. TB: It may have no eruption, can you explain? S: It may only produce lava. It is like an eruption but not an explosion. TB: if there is an explosion, what are the impact levels? S: At least the direct impacts should not pass the radius of 9 km and the extended sector 12 km from the mountain. This zone has been announced by the government. So the people within this dangerous area must be evacuated. Don’t make assumptions, because if we make a wrong assumption, it is real mistake, and if you’re right maybe it’s only just luck. TB: Compared to the Agung eruption of 1963, it was stated that the power of the eruption was 10 times higher than the Mt Merapi eruption in 2010. Is this right? What is the probability of the eruption power of Mt Agung if it erupts or explodes? S: It may higher than Merapi, it may lower, or it might not erupt at all. Look at Merapi, it can have larger eruptions than before. If Mt Agung explodes like it did before, the people removed from exclusion zone within 9 km to 12 km from the mountain will be safe. If people have moved according to the recommendations they should be safe. TB: How hot in degrees Celsius can the magma and the lava that move up Mt Agung get? S: It may around 1000 to 1300 degrees Celsius for the molten lava. It will move and then cool to a lower temperature. TB: about Mt Agung, what is the magma composed of? S: About the same as at other volcanoes, Sulphur, CO2, Silica etc. TB: What about the gas inside the magma? S: If we talk about gas, most any volcano has this. Because of the change from the hot temperature to lower or cooler, the yield of this process is gas output. Magma mixed with Sulphur gas, CO2 and others. Dunno if I would call it that. (especially based on a Wikipedia entry) But it defiantly has a lot of traffic crossing over from the moon-bat sites. Generally the Tyler authors are okay, but the commentary is a bit rarefied… possibly even laced with toxic gases. As for Surono, he is well founded in his warning. Some of the volcanoes in Indonesia can get quite spastic and there is enough energetic activity in Agung’s past to make you question what sort of event it is going to have. I saw a photo of Agung earlier this year and thought, what a beautiful Mountain looking majestically across the lake. an ash flow would be devastating as it moves quicker over water, from memory about 500km or so. According to the latest news more then 100 000 people have now evacuated, it must be scary for the inhabitants with the amount of quakes occurring, I feel uneasy about it all, I can’t understand why people still fly there in spite of it, as if it was a normal, selection of the …. Explanation of my animated gif. Whoever shot the video is not in a safe place… much like the guy with the cutting torch. I’ve heard tales of a guy getting hit in much the same way by loosening the bolts on a damaged bumper. When the nut left the last thread, the bumper knocked the snot out of him when it hit him in the chest. If so, that’s a proper usage, though the range of typical drone would require the operator to be in a hazard area. Good to see the video. It does look like some steam / gas is venting from the peak crater. But I wonder if there is also some venting on the left flank (as looking at the mountain in the video)? It is hard to say. It could simply be condensing cloud in the lee of the volcano. But it does seem to be persistent. Interesting. Thoughts? The reason Albert added my info and plot to the post was by request. I have a innate tendency to be blunt and didn’t want to alarm anyone. He’s better at smoothing out what could be seen as an alarmist statement. The last thing I want to do is feed into doom hype. The most important thing to remember, is that I am not a geologist. That being said, IF it is steam and not just an effect of the mountain causing cloud formation as the warm moist air flows past it… it could be indicative of part of a ring fault structure. If so, that could point to the rough dimensions of a potential future caldera. Originally, I had though that the nearby Batur caldera was possibly formed due to Agung draining the chamber and the caldera forming from the void that appeared under it. We’ve seen this happen before with Katmai → Novarupta and with Bardarbunga → Holuhraun. In both cases, the caldera activity was due to an eruption miles away from the volcano. (and Bardabunga is a good illustration of just how slow the process can be) Alternatively, it could point to a possible future vent. Or, more likely it’s just a cloud. Like all things, Calderas can form in catastrophic processes as well. That’s why it’s important that you remember that I am not a geologist. I’m just some guy on a computer in Florida that tends to plot stuff. I am NOT saying that is what will or even could happen… just that if things do go bad, that’s one (of many) possible scenarios. I’ll even revisit my info tagged into the main post. The rapid rate noted in the referenced paper is quite “long in the tooth” in my opinion. It could very well be approaching a slower rate period since this rapid rate episode is a bit more prolific than the previous one and may have exhausted it’s supply, or at least used up most of it. During the noted rapid rate period, the average large eruption was only about half of the 1963 eruption in volume, and tended to happen about every 340 years. Most of the current rapid rate volume was done in the 1963 eruption. So yes, there is unrest with the volcano, but it may have already played it’s biggest hand and there’s not much left to show. In all cases, I highly recommend you refer to the local geological agency for official information. They are some of best at that job in the world. They deal with these volcanoes every single day and know them much better than any of us. BTW, if it were a ring fault structure, it had to have been there from a previous eruption. 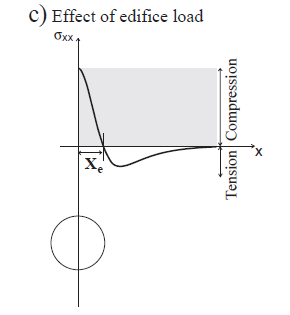 Right now the edifice would be under a compression load regime due to the chamber pressure and edifice load. H = Depth of chamber center from base of edifice. Xc, is where the tension-compression regime changes from one state to another. depending if the chamber is over pressurized or under pressurized. there where reports of fire started by the volcano from hot rocks? I doubt that. For rocks to get that hot, an unseen or undetected eruption would almost surely have happened. Aoba volcano, Vanuatu, Alert level 4. “”The Center for Volcanology and Geological Hazard Mitigation in Bali has measured the deformation or alteration of Mount Agung’s body shape. From the measurements it is known, the body of the mountain is experiencing swelling. “We are also doing the measurement of deformation to know the flowering of the mountain,” said Head of PVMBG, Kasbani, at Monitoring Station of Gunungapi Agung in Rendang Village, Rendang District, Karangasem Regency, Thursday 28 September 2017. According Kasbani, from the measurement results, the recorded tendency shows the graph continues to increase. “What we see is the tendency, the graph rises steadily, we have one of those measuring instruments on the slopes towards Besakih, we happen to measure it there and we can not add upwards because it is not possible, the time is not right now,” Kasbani said. .
Kasbani said, with the occurrence of bubbles in the body of the mountain that berketinggian 3.142 mdpl, certainly there is a strong pressure activity from the magma energy that is urgent to get out. There has to be some serious pressure building up to start deforming the mountain to this extent. And here is an image from yesterday that shows degassing in the NE wall, opposite to the center of the crater which is not degsssing, since it is likely plugged. The gas plumes are rising up to 50m high. Based on visual reports. And here is deformation data from 06-09, when Agung was already inflating by around 5.5cm/yr (around 12cm of uplift in 2,5 years), give or take half a cm. The modelled inflation source depth was 2-5km, which was corresponding to a later petrology study done 3 years later in 2012, which showed a likely shallow chamber at that depth, and a deeper one aswell near MOHO. There could be more. 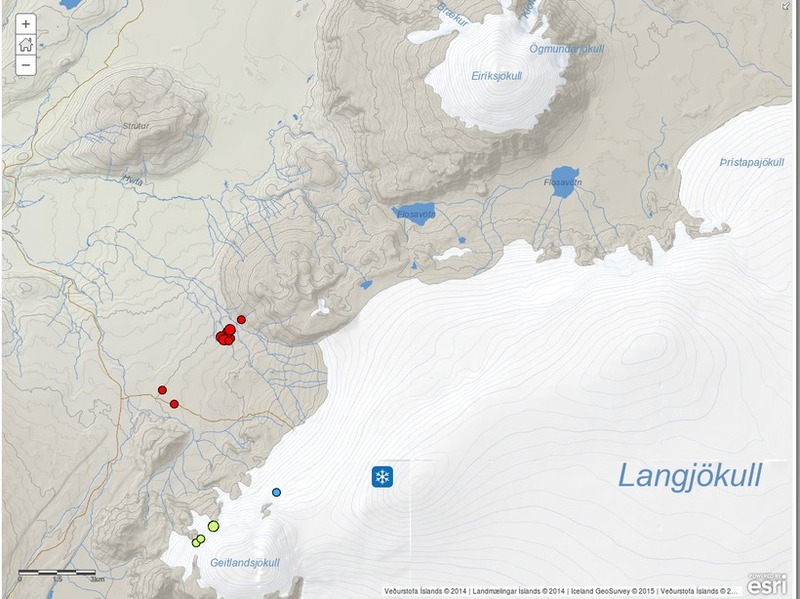 Earthquake swarm in Iceland near Husafell. Is this the geothermal field? Looking closely at a map, it looks like the swarm is almost smack on top(ca 2km NW) of Geitlandsgígur (gígur-crater) and Geitlandsrhaun(which is covering the whole area). Can’t see anything resembling geothermal activity there(not ruling it out though). Nice little swarm. Looks tectonic judging by the depths. I’ll ask Andrej for a historic plot of the area. BBC Indonesia reports a fracture inside the crater of Mt. Agung, Magma visible. Note of caution: NOT confirmed so far by the authorities, MIROVA doesn’t show any thermal readings from Agung either. Google translated headline says that magma is visible on the surface. Further down in the text, it says magma movements are seen on the surface. I suspect that magma has not yet breached the surface, but there are visible deformations indicating magma movement below. For me it’s something more then steam. Some people reports 500m plume atitude. Just degassing. Is it more than steam? Yes, there is likely some Co2, So2, and other volcanic gases mixed in there. Can they tell or predict how much SO2 a volcano might produce – is it an empirical measurement done from previous eruptions or can it be known from the type of lava for instance? I seem to remember there being an article here on it. Hello again. Greg W posted a link in an previous VolcanoCafe post that I have found informative. It is a not a quite day by day, but as he has time blog of his travels in the area. I have found it informative and interesting. I think my earlier speculation about steaming on the left flank is proven to be nonsense. You can clearly see natural cloud convection there in this video. Though it appears to be clouds now, it doesn’t fully rule out your initial impression. I agree that it’s most likely clouds, but it’s not a firm lock either way. A very interesting summary of the challenges of St Helen’s Spirit Lake. Eruptions can have impacts long after. These fumaroles remind me Pinatubo crater before the eruption. I must correct me, such fumaroles formed in Pinatubo crater in 1992, about a year after eruption. We are still getting to that point. Pinatubo pushed out a dome before it had its penultimate eruption. This is likely somewhat similar to what we would see at Agung before a big eruption (although it may be a lava flow instead of a dome since Agung is more mafic). Well I was talking specifically about the degassing level in the video. Of course things can escalate fairly quickly. And yes, we are dealing with a different set of magma here, and it is likely that Agung could follow the 63′ patter of start the eruption phase in a effusive style. Well that settles the drone question. There’s a very visible hand in the video. Interesting footage, but he must have a death wish climbing to the summit with an eruption probably imminent. In the report on Agung on this site https://earthquake-report.com/2015/04/02/volcano-news-by-volcanologist-janine-krippner/ the following part piqued my interest. Apparently some people can feel this quakes and get dizzy. Maybe this could explain why some animals seem to have an extra sense to flee from upcoming danger? I can confirm that it is possible to feel dizzy in a small earthquake – it happened to me, whilst sitting at my desk at home in London; I’d just felt the 2007 Kent Earthquake. I looked up, feeling suddenly car sick, and just then heard a quiet ‘ding’ from some wind chimes in the room. Ten minutes later, it was all over the radio that there’d been an earthquake. Think people who live beside road (Truck) or raillway. Need some reference to this affirmation. LOL: at least NEJM. May be could be related to gaz/air/altitide…. Lots of gas being released just off the coast at La Restinga. It was more likely that than tremors. Yes there was a lot of gas but I remember some report of people who told that their house moved and were dizzy, not by gas, by movement. Thanks to Granyia in Volcano HotSpot for spotting this. 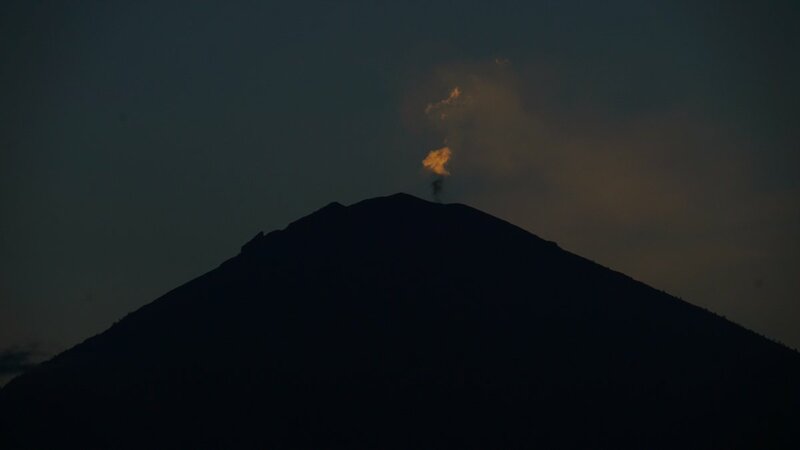 White steam clouds are occasionally observed rising 50-200 m above the summit; and currently, the emissions activity are observed to be more frequent. After a M4.2 earthquake on September 26, 2017 at 16:27 Central Indonesian Time (UTC+8), a larger white steam cloud was emitted to a height of around 500 m above the summit. I have found a live stream for Gunung Agung. Thanks, will add it in to the list in a bit. The view is good. Clouds are going by it currently. Since I don’t know the language there, I guess I would credit Telkomsel? via YouTube for the live streaming. I tried to google the location of the camera, maybe I am wrong but isn’t that right in the path of potential nastiness? That will teach me to scroll down before going off to look at Google Maps! I just spent twenty minutes tracking it only to spot your link afterwards! You arrived at exactly the same place as I did. The Volcanic / Geological Institute HQ, by the looks of it. So pleased we’ve got a live cam on it. But it appears to be throwing it down right now! And the most extraordinary sight of what looks like a massive hail shower turning the ground white! Could that not be Ash falling ? There are two glows in the background could this be heat related? No volcanic stuff. It was raining very heavily and I think a thunderstorm rolled over and dropped a load of hail before night closed in. The two lights are on buildings. And actually I wonder if my layer of hailstones might have been the camera switching to night infra-red mode! Ha ha. Still – it looks dreadfully wet there. Watching that cam isn’t easy ! At times, it’s definitely precipitation…. Then it looks like insects… And then a few minutes ago I noticed whatever those particles were, they were headed straight toward the camera…. Then they looked more like smoke or cloud…. which rolled into view then headed vertically upward…. It’s a good job I’m engaged with something else rather than worrying about what’s going on, because there’s no way of knowing until daylight. Thanks! Noticed the site just went up yesterday. Maybe others will, too when they see how many hits this one is going to get. This might be another camera or monitoring: https://www.youtube.com/watch?v=ejro0RjRpGw&pbjreload=10 found it linked off the YouTube Live Feed above. No idea on quality of content. Well, I’m really suspicious about that feed. Before it vanished, the Pos Pengamatan Gunung Berapi camera showed low cloud and rising mists from the rains overnight. The forecast was for clearing later in the day. Not sure what’s going on here. Mind you, having said that I see the wind is pulling cloud from south to north, so maybe it is still overcast in the Volcanological Institute’s location. I wonder why their account closed? No visibility was from Institute location in the morning. To many low clouds. I found this one trying to compile everything. The top three feeds are from seismographs close to Bali. The others are from unrelated volcanic regions. JAGI – is the same drumplot which is linked in this post. Second nearest is PLAI from the east. Blast it. https://www.youtube.com/watch?v=SHKSucd-Pbg has gone down. Looks like the volcanologists didn’t pay their bills? Is someone burning something down over the slope on the front of the currant live stream on youtube Clive posted or is steam suddenly appearing there? Or whatever? Oops! Not that one . I meant this one. Apparently it’s the correct one. They just want it viewed on youtube. I only put it on here to show you which site I meant. Now something is going on with the cam. According to the BBC it’s not all the evacuees. There were a lot of people from outside the exclusion zones who evacuated that weren’t supposed to. Those are the people who are being told to go home. The cam ok now. The clouds seem to be easing up. Sorry, if it has been posted before. Thanks for spotting that. I think it is a new page – my old link still fails. Now all we need is for them to dust the cobwebs off the camera! Interesting that I don’t see signs of any harmonic tremor? Just snaps and pops of expanding rock is my best guess. Can anyone estimate the probabilities that this month or this year we will have a VEI-6, 7 or 8 ? Questions are better addressed at the current post, other than an older one. Chances of VEI8: zero. Those occur once every 100,000 year or less often. VEI7’s happen once every 300 years or so, so chance per year is 0.3%, VEI6’s happen maybe twice per century, s, 2% per year but VEI6 have no significant global impacts. since yesterday (12/10), starting to have tremor non harmonic… what does it means ?